The Woofer Technology from Babolat is a patented technology that integrates how the frame and strings interact generating more control and comfortable. A tennis racket is a frame with strings. The frame is basically static and holds the driving force of the racquet - the strings - in place. Although the strings are attached to both sides of the frame, only a few string sections are active when struck by the ball. This means that regular racquet strings do not deliver their full potential. 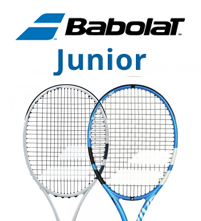 Babolat wanted to optimize the frame and the strings - to invent a frame which permits all the strings to work together to their full potential when striking the ball. * The Babolat WOOFER eliminates string lock-up: the strings are free to move. * The whole surface area reacts on impact: with the WOOFER, more strings work together when striking the ball. The strings are interactive. This increases sweetspot size, improving forgiveness during off-center shots, and absorbing much of the shock produced during ball impact. * Increase in the Trampoline Effect: The piston function enables greater surface deformation on impact, delivering 10% extra power and ensuring that the strings retain their energy for a longer time. * Shock Absorption: The pistons act like a suspension system to dampen unwanted vibration. Babolat Aerobeam The world’s most aerodynamic racquet. +15% air penetration thanks to the aerobeam technology. Cortex Babolat’s Cortex shaft vibration dampening system is designed to offer greater comfort during play. Available in two versions, the Cortex system used in the Pure series of racquets reduces harmful racquet vibrations without filtering out the feedback required for feel. 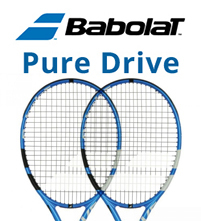 The result of filtering unnecessary vibrations results in what Babolat calls a "pure feel." 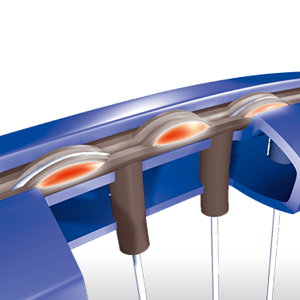 The Cortex system used in other Babolat racquets filters and dampens for maximum comfort.